Celebrity Nerd-Off with Stephen Colbert and J.J. Abrams! 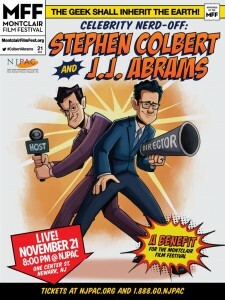 Join Stephen Colbert, host of CBS’ The Late Show With Stephen Colbert, for an evening of conversation and fun with director J.J. Abrams (Star Wars: The Force Awakens, Star Trek, Super 8). This event will feature the pair in a wide-ranging on-stage discussion of their influences, ideas, and creative work. Come and see which geek shall inherit the earth! HOW: MFF Member tickets on sale NOW. Tickets for the General Public go on sale September 11th. PLUS! The Montclair Film Festival will team up with Omaze to raffle off a special fan experience, with details to be revealed soon. Proceeds from this event and raffle to benefit The Montclair Film Festival, New Jersey’s leading film non-profit. We hope you will join us and pass this info on to your fellow fans!